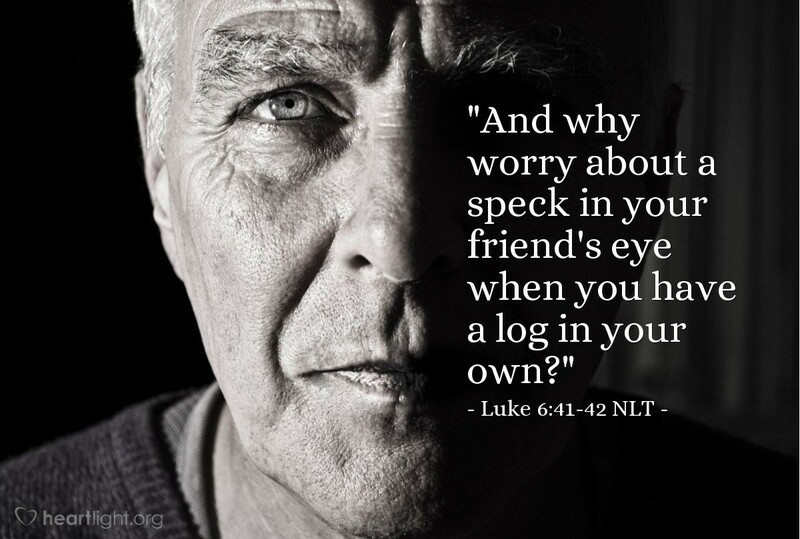 [Jesus said,] "And why worry about a speck in your friend's eye when you have a log in your own? How can you think of saying, 'Friend, let me help you get rid of that speck in your eye,' when you can't see past the log in your own eye? Hypocrite! First get rid of the log in your own eye; then you will see well enough to deal with the speck in your friend's eye." The problem with sin and forgiveness, with inconsistency, with questionable motives, and with unjust criticism is not with someone else. We must look inward at ourselves. We must look critically at ourselves. We must look correctively at ourselves. God holds us responsible for ourselves. Jesus wants us to see that our primary job is to deal with our own problems, sins, weaknesses, mistakes, inconsistencies, wrong motives, etc. Only after I've begun to address these problems in my own life can I begin to help others address the sin in their lives — and even then, I must approach them with humility, love, and grace, knowing that I'm a sinner saved by grace. O God, my heavenly Father, please forgive me for my sins. I know that I fall short of what you want me to be and what I want to be. Please help me never to use someone else's weaknesses or stumbling as an excuse for my shortcomings. In addition, Father, please open my eyes so that I never avoid my own shortcomings by pointing to the deficiencies of another. In Jesus' name, I pray. Amen.